It’s one thing to call a knife a hunter. 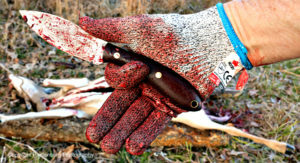 It’s another if the knife actually works in the field as a hunting knife. In this case, the L.T. Wright Large Northern Hunter is accurately named. I was hunting in south Warren County, Mississippi, looking to harvest another doe in a cull hunt. I had had a very successful season so far, and got to check out several knives by using them for their intended purposes. The L.T. Wright Large Northern Hunter is a solid working knife. Then it was time to get to work. 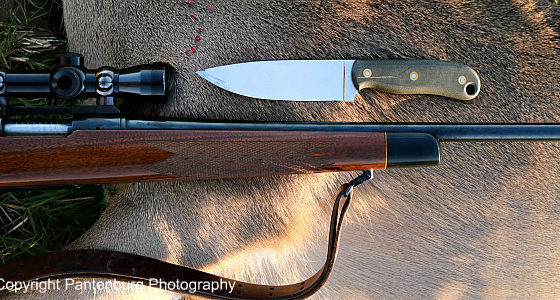 The Hunter was the primary knife used on this deer. It did the under the tail work, and was used for the initial spine-down, belly-up cut that opens up the abdomen. It split the ribcage, and was dipped in the bloody slurry of the successful heart/lung shot, and was used for some of the initial skinning. Then, it disjointed two lower legs and cut off the head. I’d call that wrung out. Obviously the knife worked well, or I would have pulled out my backup Ambush Tundra. Blade design: Based on the traditional Canadian leaf design, this design is one of my favorites. My go-to Ambush Tundra has a similar shape, and I love it for big game hunting. The hump on the spine protects the user from piercing the entrails in that first, spine down, edge up cut that opens the abdominal cavity. There is ample belly for skinning, and the blade is long enough for slicing. For a knife designated to be a slicer, you’d want a longer straight area. 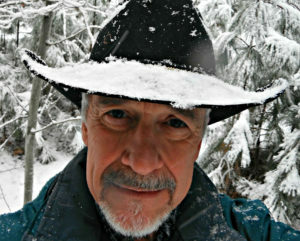 I prefer a four-to-five-inch blade on a hunting knife. That length is ideal, IMO, for the initial gutting and disjointing of the lower legs. 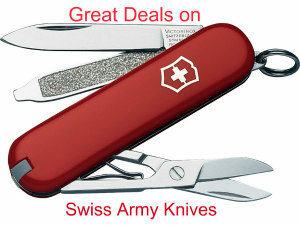 That blade is also nimble enough to use inside the cavity to cut the esophagus and diaphragm. For small game, my vote goes to a two-to-three- inch blade. Point: A drop point is almost ideal for a hunting knife. You need a point that can pierce, for the under the tail work, and still be thin enough for the detail skinning around the neck and front shoulders. The Hunter proved to work well for both. The point is centered on the lade, meaning it will also be very effective for drilling in wood. This becomes important if you’re doing bushcraft wood carving, such as whittling out bow drills for fire making. The handle design provides a solid, safe grip, even when wet or damp. Handle: Another winner. The handle allows for a solid hammer grip for woodworking, but it also works well for the other grips a hunter might use. The micarta gets tacky when wet, and there is no problem with the handle getting slippery, even when it’s covered with blood. The handle is well-designed for skinning. You can put your index finger on the spine, and grasp the end of the handle with your fourth and pinky fingers. The thumb and middle finger brace the blade and handle. Blade thickness: I like thin blades for working knives, and this comes from using them in the field. I’ve never broken a knife blade, and with today’s superior steels, a thick blade is a hindrance for field dressing big game and most bushcraft tasks. 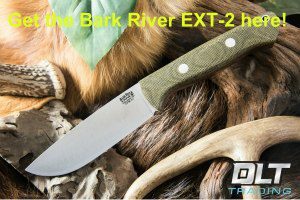 At .120-inch thick, the Large Hunter works very well for all hunting tasks, and it is also a good slicer. Steel: The large hunter is made of AEB-L Stainless @ 59-60 RC. This steel has excellent edge-holding ability, and it didn’t need sharpening when the heavy lifting was done. After being cleaned and washed, all it took was a couple strops on my jeans leg to make the Hunter paper-whittling, razor sharp again. I deliberately left blood, slime, goo and hair to dry on the blade before cleaning it. (Generally, I wipe down any blade with an alcohol wipe after field dressing animals or cleaning fish.) There was no staining at all. I was impressed with this steel. Grind: Flat grind with micro bevel. The grind on the blade will affect how well it will work. I prefer convex for a working knife, but the Hunter worked great as it was. If you sharpen free hand and/or use a strop for sharpening (You should!) eventually this edge will wear into a convex grind. Spine: Don’t overlook the spine when shopping for knives. I want a 90-degree angle on the spine, so it can be used to shred tinder and in a pinch be used to scrape a ferro rod for firemaking. The Hunter’s spine will work great. Sheath: This sturdy leather sheath is set up as a dangler. This is also my preferred style of sheath for a user knife. 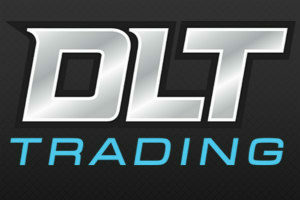 Warranty: All L.T. 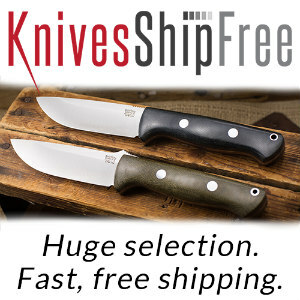 Wright knives are made in Wintersville, Ohio, and come with a lifetime guarantee. 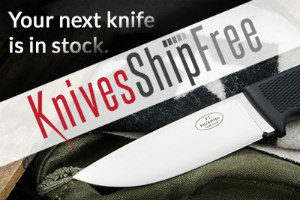 Any questions, you can call the shop and probably talk to the person who made the knife. 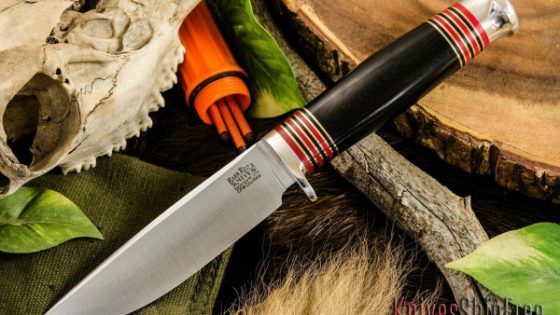 Is a Large Northern Hunter the best hunting knife for you? Could be. I couldn’t find anything about the knife I didn’t like. It’s nice that makers are using the Canadian-style point and blade. 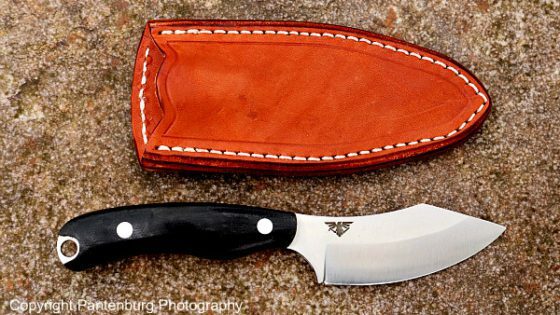 IMO, this is the best configuration for a knife that will be used primarily as a hunting/bushcraft tool. Once you use one, you’ll become a convert. When it came time to wring it out in the field, doing the work it was designed for, the Hunter came through with flying colors. 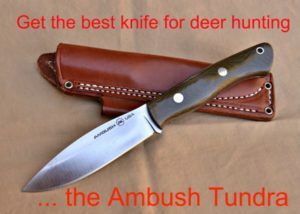 I have no doubt that this knife would perform equally well on elk, moose, bear etc. I like the company that stands behind this knife. I met many of the craftspeople at the BLADE show last year in Atlanta, and you couldn’t ask for nicer, more knowledgeable folks. All in all, you would be hard pressed to find a better hunting knife. This one is a winner. It’s a good design. I used to have a Herter’s version when I was a teen. I think I paid $4 for it. Them wuz the good ol’ days.